A better tha average Wetherspoons with enthiastic staff who are proud of their beer. Excellent beer quality including welsh micro beers. A rather interesting pub that originally started out as a pub then became a catholic church (a small one at that) and reverted to being a pub once more. The bar area is in the narrow church area with two large rooms on the left. A pleasant smoking area with tables and chairs is to the right. It's one of the few Wetherspoons with the toilets on the same level! 4 guest ales on all being locally produced Welsh ones. Service was good. According to the manager the pub gets very hectic when the students are back as this pub is their first port of call when heading for a night on the town. Rarely does a Wetherspoons pub come out as my favourite pub of the day. 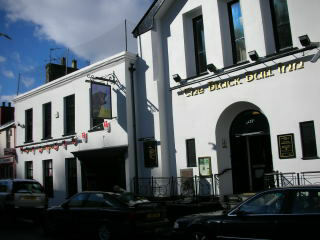 But the Black Bull marginally pipped the Tap & Spile, Boatyard and Mostyn Arms as my favourite pub in Bangor. The beer range wasn't brilliant for a Wetherspoons - Marstons Pedigree, Greene King Abbot & Ruddles Best, Wychwood Hobgoblin & Nethergate Old Growler. The cider & perry range was good - Westons Old Rosie & Cider Twist Raspberry plus Broadoak Perry were available. The interior has more character than a standard Wetherspoons, with the small bar area occupying a former church. The lower level is more typical of the brand with its open plan modern style and tables packed in a little too tightly. A good option in the town centre. We arrived "off peak" so didn't experience any negative vibes. Bar staff a bit surly but beer was good quality. A small group of blokes looking to start WWIII and I can imagine what this might be when multiplied up for a later session! !